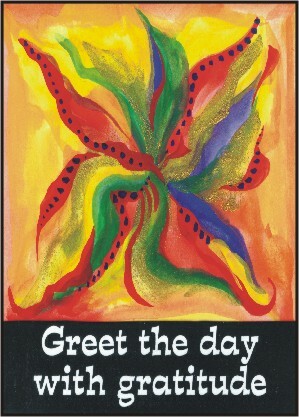 GREET The Day with Gratitude - a 5x7 poster with whimsical floral art by Raphaella Vaisseau - a beautiful reminder to express appreciation as you awaken each day - for life, for family, home, friends, work, health, pets, earth, the sun ... for all of it. Be thankful. Love yourself. Love life.